As the team knows, I have been on pause in our team while wrapping up the stressful last part of business school and looking for funding so I can continue this team. So today’s meeting will again be short, just reports on if you’ve been doing anything in the group, and open time for discussion/questions. First I’ll just give a quick recap of what our team is about, for the new folks joining today and lurkers who may be watching. We help WordPress meetups and WordCamps attract and develop more diverse speakers. We do this with a hands-on workshop that we have available for everyone in WordPress. We also offer training on the workshop. It can take anywhere from 1 – 4 hours to run it, depending on how many modules you run and what your time restrictions are. The 6 countries who ran it last year went from approx 10% of fewer speakers of underrepresented groups to most of them 50% or more! I know that most of us have been doing less while I’ve been on pause, but here is your chance to tell us if you’ve been working on anything, if you’ve got obstacles, etc. Thanks for your great work on that as always, @cguntur! I will be submitting my communication and domain content when I get back from wcmia! She’s speaking about bringing on new trainers to our team to train the meetups on running the workshop. And the item about Maria is one of the folks in our Helpscout queue who would like a training. I’ll leave reports open if anyone wants to add anything while we go on to the next section. i want to speak in meetup but i don’t know about topic ? so how can team help me ? May I ask what part of the world you live in, Meet? Do you think you or anyone in your community might like to run the workshop for your meetup? Due to lined up meetups I was not able to conduct. Also have requested for One training session to recap the things. @miriamgoldman is planning out time to do that. We allow to speak in local language you can connect with me or Ronak for more details. That sounds great, @bhargavmehta. Let us know if there is any other way we can support you. Thinking back to what you’ve learned in WordPress so far or what you’re going to learn soon, do you have a story to tell? Something you created that you’re proud of? Mistakes you made when you learned how to do something? An interesting way you discovered how to do something? Business or life challenges in the way of doing WordPress? The first time you did something? @lidarroy, do you have any questions about how our team can help your meetup, about joining our team, or anything else? this questions are help me lots and thanks @jillbinder. Thanks for solving doubts. Thanks all for joining today. Get in touch with me for joining the team or any team questions. See you for our next meeting the 4th week of March! As I’ve told folks privately, today’s meeting will likely be shorter because I am doing less on the project this month while I look for funding so I can continue leading this project, as well as I’m launching my business doing this work for more technologies — my business launch night is in a week and there is a lot to do for it. Open discussion / questions / obstacles / etc. I will continue to help with anything that is in the way of what you are working on, so please do let me know about that. I know @jamieschmid and @laryswan will need my help soon to continue working on the Communication Strategy piece. I don’t have much to report, as the musical took up my time lately. I’m going to be scheduling a “Train the Trainers” onboarding call soon, and I’m looking as to when I can hold another training. I’m going to do one in the AM UTC one weekend. Those will be excellent for us to have. Thanks, @miriamgoldman! Yeah Amy. We can definitely talk about that! A little background for those who dont know.. 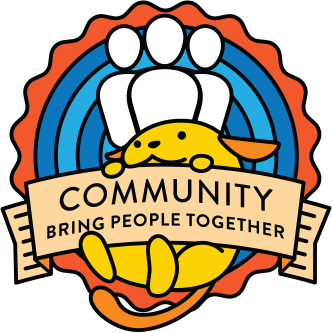 I am an open source community ambassador who works in the drupal and wp space… I regularly attend meetups, camps and conferences. I do not have “client” work, community is my focus. Amy, that is amazing. I am so honoured that you would like to use some of your community work time with us. So we have a workshop that we offer to WordPress meetups to run, that helps women and other underrepresented folks who are feeling stopped by Impostor Syndrome work through that in a hands-on way and come out feeling motivated to do a talk. We recommend that all members start with leading it in their own city. We have the material all ready to go. Just like the process with meetups, you can either just take the material and run it, or you can request training from us. 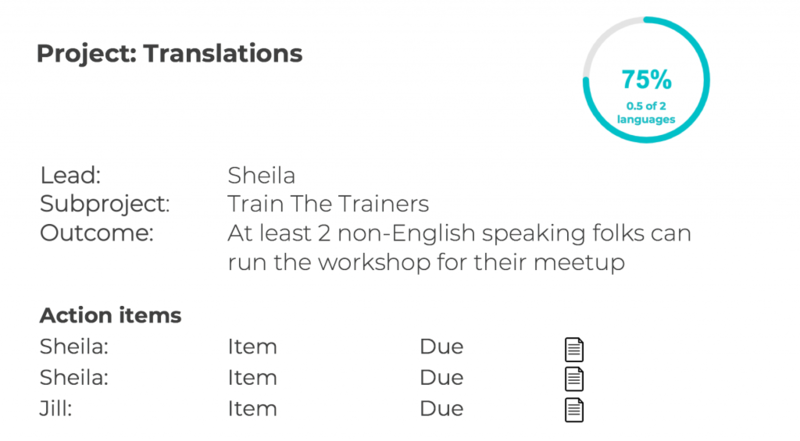 And then we also have a special Onboarding training where you get more of the background info on how to run a Train the Trainers session. I believe that is the piece that @miriamgoldman is talking about. She is now spearheading that process. sounds good. I live in the San Francisco bay area – there are a lot of meetups here. I do have some experience leading trainings, so I might be an easy pupil. @amyjune , one of our projects for this year will be to improve our training, so that will be one of the opportunities to help! I’d love to hear more from you about Inclusive Content Strategy, Amy. It might even be relevant to the rebranding exercise that our Communications team is doing. I love it!! I can hep where-ever and however. And then we usually have a new Trainer co-lead with an established trainer, and then let us know when you feel ready to go on your own. Currently we run them once (sometimes twice) a month. As we scale up to reach more meetups, we will increase the frequency. It’s great to get more Trainers ready now for when we start later in the year. The other way to dive in deep fast is to either watch the video of our 2019 kick off or read the recap of it. I can watch the video. Now is this the sort of thing we can take to spaces like the Pantheon offices, for example? Unofficially outside of this team, absolutely yes. That is part of what I am doing in my new business, in fact. And I know there are several companies who did our material within their teams last year. I am thrilled to get started!! Thanks for being here, everyone. See you on the second Wednesday of March! Start talking about the new year goals a little bit – with more in depth discussions in the upcoming weekend Zoom call. I’m thrilled that with the new year, we have a number of folks joining or returning to the group. It’s a great way to start off the year. And with our new focuses for the year, it’s great to have more joining. And we get that it’s volunteer. People come and go. Do what you need to do. We are glad for any help that we get, no matter how big or small. In 2019 we have new goals, but this is still a great start, as the end goal in that doc is where I’d like you to start: considering running the workshop in your city. More in that in a bit. Also! This is new: We have a new, quick questionnaire for new folks to fill out so I can get to know you and help me direct what you’re doing in the team so that it’s fulfilling for you. I’d also like to get all current members to fill it out too, please! 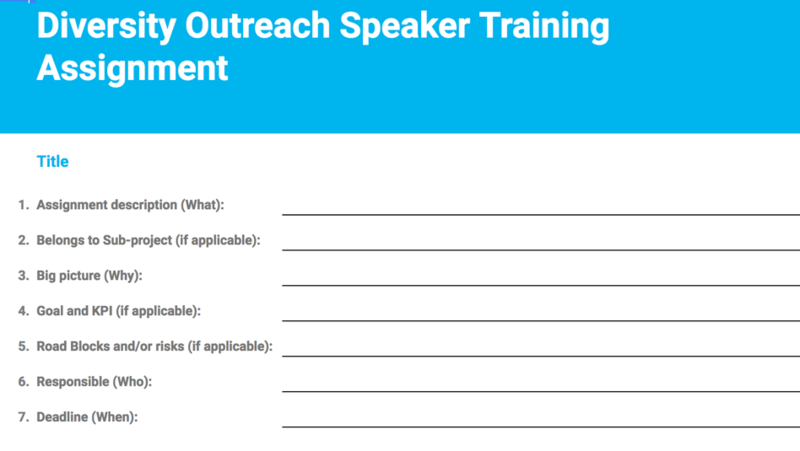 The first thing I would like all folks in the team to do, new and old, is to consider running our speaker training / diversity outreach workshop in your local city. Before starting to ask people to do this last year, folks were feeling lost on what we are about. Doing the workshop helps you understand it intimately. After that, folks started being able to think through more, make decisions within the team, and jump in where needed. And then some may be interested in going on to be Trainers in our team to help Meetups around the world run theirs. Any obstacles you may encounter to running it will likely be things you’ll be helping Meetups overcome, so it’s a great practice and training ground. It’s just suggested. You can of course participate in our team without having run it. Only a few have run it so far. Though most have attended a training, and even just that in itself helped them understand more of what we’re doing and helped them be able to participate more. angelasjin: I don’t have anyone signed up for the session tomorrow yet, so I’d love for you to join! @jamieschmid: How long do the trainings last? @jillbinder: They are currently 2 hours, though one of our goals for this year is to shorten them. It’s a 1h and 20m recording, and then time before to connect with the participants and set them up, and time afterwards to answer questions and help them get the resources they need. If you don’t have all that time, I can also just give you the script that includes the recordings and what we say before and after. That is also something that we offer to participants if they don’t have the time as well. @jamieschmid: So as a trainer, you play a recording during the meetup and do in person interaction before and after? @jillbinder: Yes! In person being on a webcam call, as we are training folks all over the world. We also prompt them to participate in the recording in the Zoom text chat window. As in the recording there are exercises that the recorded people are following, and we like the participants to be doing them as well. @jamieschmid: That’s sort of confusing. Perhaps we can come up with a better name for the train-the-trainers people and sessions. Or vice versa. @jillbinder: I would like that! There are a number of things I’d like us to look at renaming this year. I’ll mention them later in the meeting. I have a training on the 27th if people can’t make @angelasjin tomorrow. Also trying to prod my team here in Ottawa to kick off WordCamp planning, so I can actually plan to run the workshop here! Oh yes, I applied to WCEU, WordCamp Calgary, and WC Nordic – and our team will be heavily mentioned if accepted. This morning, I sent out a number of emails to see if anyone wants to join the training session tomorrow. I’ll keep an eye on the queue and will follow up if needed. Not much except keeping an eye on HelpScout. I submitted our workshop for WCEU. @jillbinder: I applied to WCEU as well. It would be great if we both get in and talk about our work! @newyorkerlaura: I also applied at EU, not on a diversity talk. @newyorklaura: I don’t want to step on @simo70’s toes, but was wondering if there would be any need for practical help during the workshop whether is was handing things out or whatever. @jamieschmid: I’m doing a WP101 at WCPhoenix and I’ll mention our work. The most active team members and I met late last year to talk about how we did in 2018 and what we’d like to do in 2019. I’d like to share with you in depth what we discussed on a web cam call so we can have more organic discussions about it. We are choosing a time for this official kick off meeting for a Zoom call in the next two weekends. Please choose as many times as you can most likely make it. Please fill it out by 11:59pm Pacific time this Thursday, January 10. I’ll give a preview now, planting the seeds before our call. Helping meetups who have run the workshop before do it again. They may have new folks running it who didn’t do it last year, or are coasting off of the success of year 1 and thus are less successful in year 2. So year 1 was a lot of getting things started. I let go of perfect in order to get things done. New name for our group. The current name is long and hard to say, and it is becoming increasingly important as I seek funding for leading the team to have something short and clear. @cguntur: Unfortunately, I will not be able to attend a weekend meeting in Jan. But, I would still love to help. I might be able to help with getting a project management system in place. @jillbinder: Ok, thanks @cguntur! We’ll do our best to write up a good recap. If people on the call are ok with it, I may also record it. Of note: I am in a business school right now working on how to take this diversity work further and make a bigger impact — and one of my classmates specializes in project management. He’s started helping me think through the needs of the team. We have a Google folder now! And inside that folder is a document with links to where everything lives, as not all are google docs. @jamieschmid: Can we create a google doc for brainstorming names? @jamieschmid: Yes. I’ll be adding a brainstorm doc to the drive folder/doc list so we can decide on a hashtag for Diversity Outreach-related discussion! I don’t know about you, but I was finding I was getting overwhelmed easily doing work, life, and this kind of volunteer work. A few months ago I started a new, simpler productivity system. Those in the team might have noticed that I suddenly got on the ball again and got a lot more done. 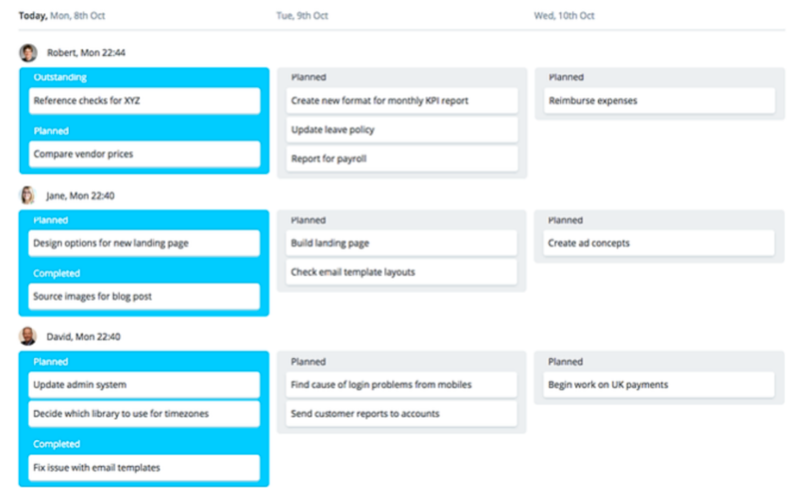 @jamieschmid: I LOVE the productivity idea! Joining. @jamieschmid: Someone mentioned HelpScout. What is that and is it something we are using in this team? @jillbinder: Good q, @jamieschmid! It’s the customer service emailing system that the Community Team (which we are a part of) uses. When meetups fill out the form on https://tiny.cc/wpwomenspeak they go into our Helpscout queue and we communicate with them there. One of the reasons for it is so that anyone on the team who has access can jump in and communicate with them. It also lets us keep track of who is Active, Closed, Dormant, waiting for training, been trained, etc. I request access from the Community Team for it on an as needed basis. So only a handful in our team are on it right now. @miriamgoldman: I’m excited for what 2019 brings us! @jillbinder: @miriamgoldman It’s going to be a great year! I’m excited too. Don’t forget to fill out the doodle poll, all. Before the meeting today, this Saturday was winning for our Zoom call, and now the Saturday after is winning. There is still time to sway it. Thanks everyone for being in the meeting today. Great energy. See you soon! @jamieschmid starts up a google doc for brainstorming the name for the group, our new hashtag, and how we refer to the workshop and trainings. What you are thinking of volunteering for in WordPress in the new year? The Diversity Outreach Speaker Training group is done with the initial birth process. We are now well established. We have clear roles for people to be doing and we have had incredible success in 2018. This coming year there will be roles for those who want to maintain our work, help us grow, and help our work be more sustainable so that it continues for years to come. We also always welcome lurkers. Having people around in the meetings or in our chat group giving feedback once in a while is still helpful! If you’d like to take part, please comment on this post with your WordPress Slack handle. Although our meetings are normally on Slack, we are scheduling a kick-off meeting to talk about all the new things we’re doing in 2019 on Zoom. We are having it on a weekend as too many team members are unable to do a web call at our usual weekday meeting time. If you’re on the team or have let me know that you are joining, please choose as many times as you can most likely make it. Please fill it out by 11:59pm Pacific time this Thursday, January 10. I have been working hard on looking back over 2018 and creating our big plans for 2019. 2019 will be a mix of continuing what we are currently doing and improving on it, so there will be something to do for all different kinds of group member participation styles. Improving and growing. I’ll talk more about this in January, but we’d like to really scale up what we’re doing and reach many more meetup chapters. Been a quiet two weeks again, running a train the trainers this upcoming Sunday. Christie Witt and I are actually planning to run the workshop in the new year in Ottawa, once we resume WordCamp planning. Pretty quiet for me too, although I had a few conversations about this group at WCUS, all very positive. I’m working on the next workshop in Seattle as well! On that note, one of the things I’d like us to focus on in 2019 is supporting meetups to maintain running it. Seattle was a great example of doing it really well the first year and then with a change in speaker wranglers, some things got lost in translation the second year. More on that in our January meeting. I haven’t been to the Durham Region chapter in the last couple of months. My intention is to meet up in January if they have one. WordCamp Toronto was very successful. While I wasn’t able to attend, I did my best to help before hand. Are working on making our training process smoother! I’ve been encouraging folks in our team as a first step of participation to run the workshop for their local community, if they can. gave advice and support to 55 meetup organizers in 26 countries (!! ), and diversity outreach speaker workshops were run by 12 WordPress chapter meetups in 6 countries. And not only chapter meetups ran it. Also companies that work in WordPress, affiliated WordPress organizations, and regions that don’t have meetups. And the year isn’t over! We have spent so much time this year doing. I would like to take a moment to reflect on our individual accomplishments. And you may even feel there is something you’ve done that wasn’t thanked, or you’d like to be thanked again. What would you like to acknowledge a team member(s) for? I would like to start off the first meeting of 2019 as a webcam call (on Zoom). * We meaning our Train The Trainers subgroup have created our goals and outline together recently. Please fill out the poll I sent you Monday. Thanks! I feel like the train the trainers still have a few pieces we need to smooth out. I’m wondering what your thoughts are on the best way for us to go about doing that. That may be a question more specific for @angelasjin and @miriamgoldman who are here from that group today. Not the whole re-recording the training. That’s a big piece that will take a few months. But I’m thinking of things like making sure folks know when trainings are, figuring out processes for our Dormants and for sending out our email questionnaires, etc. I have a few ideas for dealing with Dormants, in terms of when we tag them, etc. Wonderful! After we have figured out what and how we can automate, I’ll see if it makes sense to loop you in to put it in place. I think that there is some more automation we can employ for sure, but I haven’t quite solidified what that looks like in my mind. I know @larryswanson and @jillbinder had some thoughts on tools. I’m probably going to do some research in my downtime over the holidays. My office is shut between Christmas and New Year’s, so I’ll have some time! To solve this, I have created a doc of docs. Let me know if that works or if we should still create a folder. Thanks in advance for helping to think through our logistics. I can send you the list of what we are still thinking through. Wish to know more about Diversity Outreach program as it is something I have been following but not able to understand. A brief introduction of diversity outreach program, As I am one of the co-organisers I wish to know more about it. Can I also get trained or contribute? If you’d like to get involved, a great first step would be to take our training and then if you’d like to, run the workshop in your city. It just so happens we have one last training of 2018 this coming Sunday. If you can’t make it, please send me your answers in advance. Participation is optional of course, but we’ve done so much this year and I would really like to commemorate our efforts, looking back over our great Phase 1 2018 work before we move into an exciting Phase 2 in 2019. 2. I would like to have a meeting in early January to kick off Phase 2 by webcam. We’ll talk about the new things we’re doing in the new year and see how people would like to help (big, small, or just lurking… all is welcome). My question there is is it better for you to join a webcam call at our usual meeting time or on a weekend? Please let me know here or DM me on Slack (@jillbinder). New folk are also welcome at this December meeting or in January. Please join us!